Premier Suites now offer a home away from home, perfect alternative Accommodation when considering places to stay in Dublin. Luxurious suites offer your own space to cook, relax and entertain all in the privacy of your own suite. 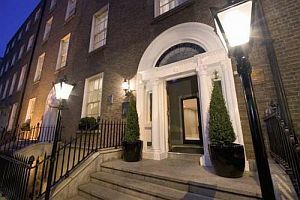 Premier Suites Dublin Leeson Street is the perfect alternative accommodaton when staying and exploring Dublin City and the ideal alternative to hotel accommodation. Located in the centre of Georgian Dublin, around the corner from St Stephens Green and a short stroll from Grafton Street. PREMIER SUITES PLUS Dublin Leeson Street is a luxury hotel alternative; enjoy the sophistication & calm of a traditional hotel stay but with the freedom and ease of your own home. Ideally loacted to visit many of Dublin's tourist attractions including Book of Kells, The Jameson Distillery, Christ Church Cathedral, The Chester Beatty Library and much more. With Dublin City in your door step you will be spoiled for choice. Right outside our front door are a range of restaurants, bars, theatres, shops and so much more. You won't need to travel far to find some local entertainment, delicacy or popular tourist spot. The Sugar Club Dublin Ireland is located just stone's throw away from us. It's banquette seating and small round tables fill the auditorium used for wide range of cultural events. Also live music is performed most of the nights. Enjoy the freedom of your own spacious apartment where you can cook, relax & entertain all in the privacy in your home from home. We are located a 5 minute walk from Grafton Street and Temple Barin Dublin City Centre where the best restaurants and bars are accessible whitin short distance of walk. PREMIER SUITES PLUS Dublin Leeson Street boasts a central location in Dublin 2. Nearby you'll find some Dublin most popular venues for sports, concerts & conferences. All of which are a short drive from our front door. A range of public transport is available to easily get you to your venue of choice. See Croke Park Stadium , Aviva Stadiu, See Dublin Convention Centre , RDS. This luxurious property, Premier Suites on Leeson street consists of 27 suites and 3 spacious penthouses. In each room you will find a range of amenities including large flat screen TV’s, laptop safes, comfortable couches and complimentary internet access either wired or wireless. All suites are decorated in warm tones and finished to an exceptionally high standard including granite work surfaces in the kitchen, marble in the bathrooms & heated towel rails. Choose from 1 or 2 bedroom suites or treat yourself and upgrade to one of our penthouse suites. Every room offers a well equipped kitchen with all the modern necessities, open plan living areas with space to dine or to relax in front of the TV, luxuriously comfortable bedrooms and modern bathrooms with lavish toiletries.